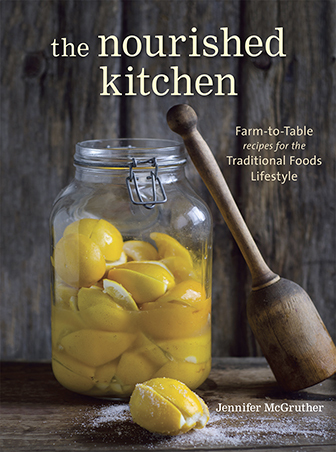 I’m a lover of lard and butter, and all those rich, delicious old-school traditional fats. So while I’ve nothing against fat, I do try to avoid frying foods at all costs. I can’t handle the mess, and the expense of wasted fats leaves me dizzy. I’m not one to complain about the cost of real food, but neither am I one to waste it. Instead, I rely on my oven (and skill) to yield the same results, and one of my family’s favorite foods is Oven-fried Chicken Drumsticks. 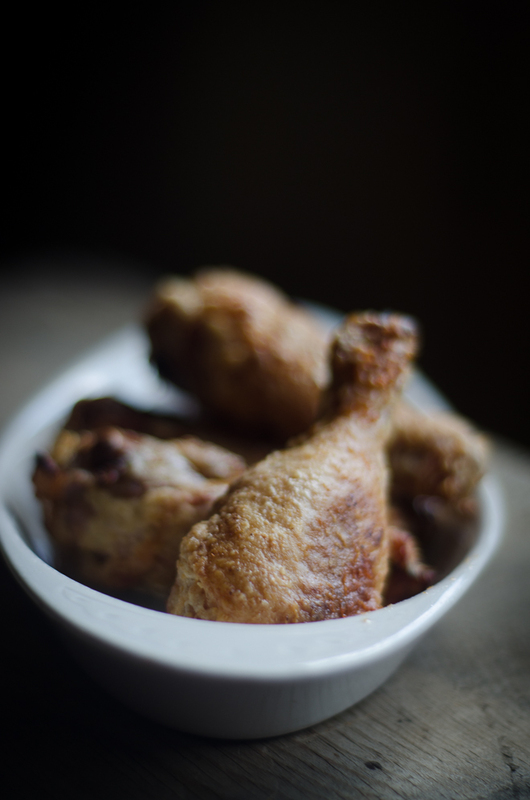 I tuck the drumsticks away into picnic baskets, serving them with cole slaw, potato salad, or brine-pickled beets. I toss a few bottles of homemade root beer or water kefir into the basket, and we head on our way – to the park, to the creek or to the various open-air concerts that come together each summer in our little town in the mountains. The prolonged cooking required for oven-fried chicken drumsticks to acquire they’re crispy skin presents a potential problem: dried out meat. When I prepare drumsticks, I start first by brining the meat in a solution of salt, water and honey flavored by a single chile pepper. Brining helps to improve the the texture, flavor and moisture of many cuts of poultry, but pasture-raised poultry sees even greater benefits as it tends toward dryness. 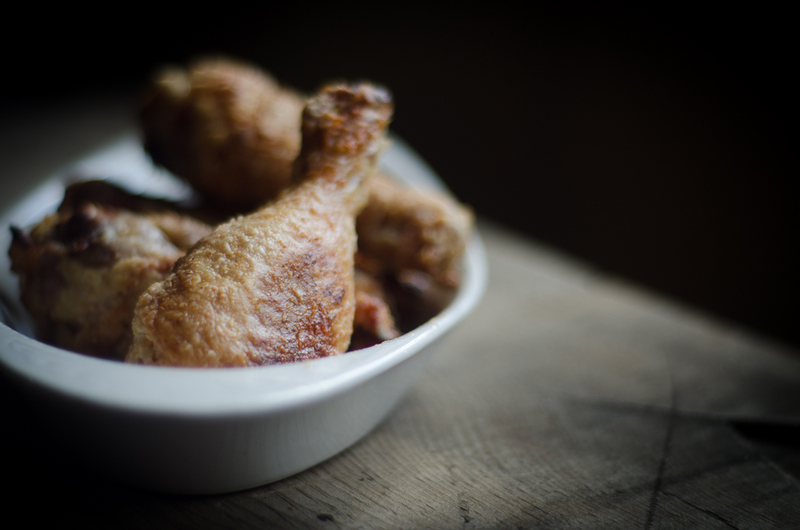 To keep the skin on your drumsticks from being soggy, remember to drain the brine very well, and pat the drumsticks thoroughly dry before baking them. Finally, crisp the skin with about 15 minutes in a very hot oven. Then serve. Brining the chicken drumsticks for a few hours before baking ensures that the meat is tender and moist, while the skin crisps in the oven. Pack them away for picnics, or serve with mashed potatoes, gravy and buttered vegetables. Whisk 3 tablespoons sea salt and honey with about 2 quarts warm water to create a brine. Place chicken drumsticks into a large mixing bowl, cover with brine, and drop in a guajillo chile pepper. Cover, and transfer to the refrigerator where the chicken drumsticks should marinate for 4 hours. 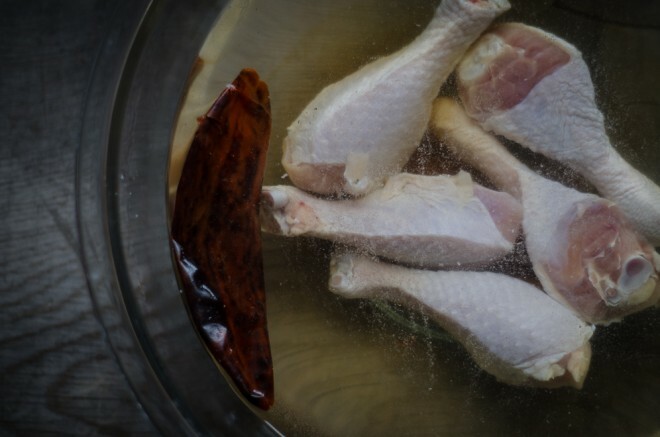 Drain off the brine, discard the chile, and pat the drumsticks dry. Whisk the flour with salt, nutritional yeast, thyme and cayenne pepper. Dredge the chicken drumsticks in the seasoned flour until well-coated, then arrange them in a single layer on the baking sheet. Bake for 45 minutesr, turning once, then increase the oven temperature to 425 and continue baking a further 15 minutes. Hi there, I’m new to your blog, I was wondering what the purpose of the nutritional yeast is? I.e. can it be omitted? I hope this comment isn’t violating your rule about not asking about substitutions. It’s for flavoring, and it can absolutely be omitted. I think you had a tip for prolonging the life of fruit and it may have involved vinegar and water but not sure? Anyone help me? Here in our country we call it “Buro” or fermented in english. Here are some suggestions. The chicken is marinating! Thanks for the post. I’m wondering if the chicken will be a little spicy for one of my daughters? She is a bit sensitive to heat. I’d skip the cayenne in the flour mix, but other than that, it should be fine. Those look super delish! I would love those for dinner tonight. The family loved the chicken. The little one ate it with the cayenne. This will stay in our rotation….thank Jenny! Sounds great and i just happen to have some drumsticks in my fridge. 2 quarts of water seems a lot for 12 drumsticks. Is that right? I’m also wondering if I could brine them overnight and bake them then next evening? Thanks for the fantastic website by the way. My family are using lots of recipes from nourishing traditions and your website is really informative. made this last night with roasted potatoes, homemade sauerkraut and a new green I’d never heard of called tatsoi from the farm stand! So amazing…I left off the pepper and cayenne in the chicken on account of a very picky 7 year old. Still delicious and no complaints! Thanks for all your wonderful recipes and ideas! Made this tonight. Definitely a new favourite. The cayenne pepper added delicious heat to the batter. Thanks Jen for this receipe. I made this for dinner without the chili and it was awesome. The girls loved it too and i am looking forward to the leftovers tomorrow for lunch! It is awesome! One of our favorites, for sure. Hey Jenny – wondering if you’ve ever tried this in your clay pot? Can’t wait to try this for my poultry loving husband! My oven has a convection setting – would you use it and if so how might you modify your baking times? using convection oven, cook @ 325 degrees for 22.5 minutes ,turn & cook for additional 22.5 minutes. Then increase temperature tp 400 degrees & cook for 15 minutes. Hope this helps. Chicken came out great, but when i went to turn it halfway through cooking , the skin was stuck to the parchment paper…any ideas? My family LOVES these chicken legs! 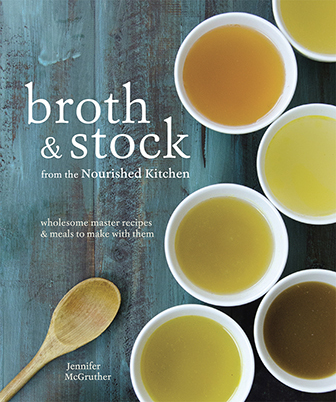 Thank you so much for a amazing way to make chicken during the cold winter months. The brining is the absolute key to keeping them so tender and moist. The last 15 minutes of crisping them up is so brilliant. Sometimes baked chicken is so soggy and yuck…but this skin is so eatable! Even the breading is 3 year old approved – with all the peppers and seasonings!! It’s very mild. Thank you again for an excellent chicken recipe. Would it be OK to brine them for longer than 4 hours? Hi, Thank you for the recipe, can’t wait to try it…can the chicken be skinless or needs the skin on? Thanks again! I keep the skin on – the flavor and crunch is better that way. I’ve been oven-frying chicken (including pastured) for 50 years using my mother’s method: preheat oven to 425, put chicken in roasting pan skin-side down and roast 20 minutes; turn chicken to skin-side up, drop temperature to 400, and roast 20 minutes. Serve. Perfect and crispy. I do this with just rubs, or shaken in seasoned flour. If chicken is particularly lean, I sometimes spray the pan first, but it’s usually not necessary.